Lamb Chop's Ukulele Cookin': The Brittni Paiva Interview: "The only limit you have is the limit of your mind." The Brittni Paiva Interview: "The only limit you have is the limit of your mind." 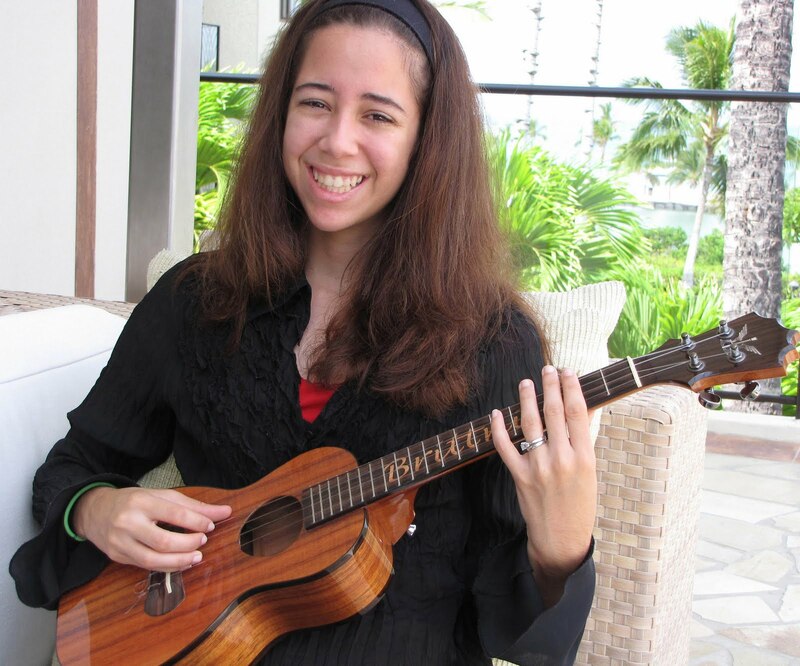 Of the thousands of ukulele players around these days, only a handful have reached the level of Brittni Paiva, the 21-year-old ukulele artist who, like Jake Shimabukuro, is stunning millions in YouTube videos and on stages around the world. 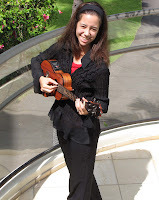 Propelled to fame by her four albums, as well as her highly acclaimed version of “Somewhere Over the Rainbow,” which has counted nearly 640,000 YouTube hits, Brittni is one of the preeminent ukulele players of our time. 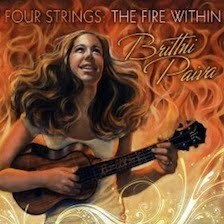 Brittni’s latest album, Four Strings: The Fire Within, shows a level of musical maturity and mastery that belies her years. While Brittni has been playing ukulele since her grandfather Isaac Takayama gifted her one over ten years ago, her style is one of decades more experience. Showing Latin and Hawaiian influences, the latest album is a jazz work that puts me in mind of such artists as Strunz and Farah or bassist Brian Bromberg. The second cut is the first of the album’s four written by Brittni. "Crusin’ on 7," named in honor of the seven pounds of boost on her newly turbocharged car, is a fast moving, happy tune reminicent of such iconic jazz anthems as Chuck Mangione’s “Feel’s So Good” or Spiro Gyra’s “Morning Dance.” “Made for Me” is a slower, more romantic number written for her husband, Branden (who, according to Brittni’s liner notes, helped Brittni “muscle” in her car’s turbocharger). “Fusion: East” and “Fusion: West” are twin takes on a common theme, one in Western and one in Eastern style. The two work together wonderfully and conjure up an early Return to Forever vibe. The album also features Brittni’s renditions of “Sunday Morning” and “Acelrou.” Toronto guitarist Johannes Lindstead plays classical guitar in his duet with Brittni on his “Hour of the Lamps.” Once agin, the technical brilliance and musicality is stunning and the two play well off one another. Brittni, a native of Hilo, on the Big Island, recently took time out of her busy schedule to answer a few question about her new album, her musical spirit, and her love of ukulele. Lamb Chop Ukulele (LCU): Brittni, one of the things that strikes your listeners is how, at age 21, your music is so mature and informed. What has helped you form such a musical spirit that some describe as beyond your years? Brittni: Well, I'm not too sure how I would describe being able to form my musical spirit, as I've found that I tend to relate to music on more of an emotional level and less of an analytical level. I guess how I could best explain it is that I allow my soul to "speak" through my fingers and have it come out in the language of music, so what you hear is the "artwork" that my heart and soul has painted. LCU: Tell us about the new album, “Four Strings: The Fire Within.” What is the meaning behind the title and how did the project come about? Brittni: Four Strings: The Fire Within is my fourth release here in the State of Hawaii. When it came time to name the album, it was one of those questions where we thought too hard to find the answer when it was just very simple. The title is about the fire and passion that I have for my music, and for music in general. It also explains in a nutshell the growth in my craft since the last album. LCU: What was it like to work with Grammy Award-winning producer Charles Michael Brotman on the album? Brittni: Working with Charles was lots of fun! He's a great engineer and has a great studio setup. It was also fun tossing ideas back and forth and talking about music. LCU: How do you feel your work has changed from your first to your fourth album? Brittni: I think it's changed a lot in terms of musical understanding and experience. When I made my first album, I didn't listen to as many different genres of music as I do now, so experiencing many different forms of music helped me to understand how certain things are played in various types of music, and with that understanding I can implement them into my own style. LCU: Your grandfather introduced you to ukulele – how did that come about and what was it about the ukulele that made you want to make it your instrument of choice? Brittni: My grandfather introduced me to the ukulele when I was 11 years old. He bought me my first ukulele and said, "Here, Brittni, try playing around with this and see if you like it." It was love at first touch! It's a small instrument, very unassuming. You can take it anywhere and play anything on it. It's so fun to play and makes everyone smile, and I guess that's what makes me, as well as others, keep going back for more. LCU: I know you have had musical training since age four, but would you describe yourself more as a musician who plays by reading or by ear or a combination of both? Brittni: On occasion, I do learn through a combination of both, but if given a choice, I'd rather learn by listening and/or watching. It allows me to feel the music better and gives me a better guide to play it with my own interpretation. LCU: Who are some of your favorite musicians and what do you draw from them? Carlos Santana, for example, seems to have had a role not just in cover choices, but in that you are both such clear, articulate players. Brittni: Definitely. Carlos Santana is a big influence for me. Another major influence is Orianthi. She is one of few female guitarists and I really look up to her musicianship. Other influences include Fourplay, Oz Noy, Rogrigo y Gabriela, Slash, Earth Wind & Fire, Steve Vai, Jeff Beck, Marty Friedman, Rob Marcello, Guthrie Govan, Michel Camilo, Chick Corea, America, Paramore, Victor Wooten, Maroon 5, and the list goes on. LCU: How do you come up with your originals? Do you have an idea and work it out on ukulele or do you discover tunes as your practice? Brittni: There will be certain situation that will spark and idea for a tune, but most of my writing takes place as I'm practicing. Usually I'll be playing random chords and progressions and I'll end up putting one together that sounds like it could be a song. LCU: Every cover I have heard you play is uniquely yours, from “Europa” to “Somewhere Over the Rainbow.” How do you go about making such recognizable songs your own? Brittni: Well, I like to say that my style is a mashup of many different styles. When I pick a song to arrange, like "Europa" for example, I'll first learn to play the song how the original artist played it, and then I'll add different little chops here and there to make it sound different but still recognizable. LCU: Please tell us a bit about your beautiful KoAloha ukulele. How long have you had that one and do you play any others? Brittni: I've had my current ukulele for almost two years now. I absolutely love playing my KoAloha! The tone is exquisite and the feel of it is perfect for me. I have a few other KoAloha ukuleles that I play on a daily basis, as the one you see in pictures is the one I use on stage. LCU: You play low-G. How do you feel the low-G compliments your playing? Brittni: I think it compliments my style well. I like to keep a little "bassline" going sometimes and the low G string helps me accomplish that. It also gives certain songs a bit of a bigger sound when it needs to. LCU: Do you ever use a high-G ukulele in concert or on your albums? Brittni: I haven't used an ukulele with a high G string on any of my albums yet, but I do practice with one often. LCU: Ukulele has become so popular over the past decade, and you are a big part of that popularity. People know of your work, watch you on YouTube, attend your workshops – what is it that you think explains the popularity of the instrument? Brittni: The ukulele is a tiny instrument, unassuming, and brings a smile to everyone as soon as it's played. I believe the joy that it brings drives everyone to want to learn it. 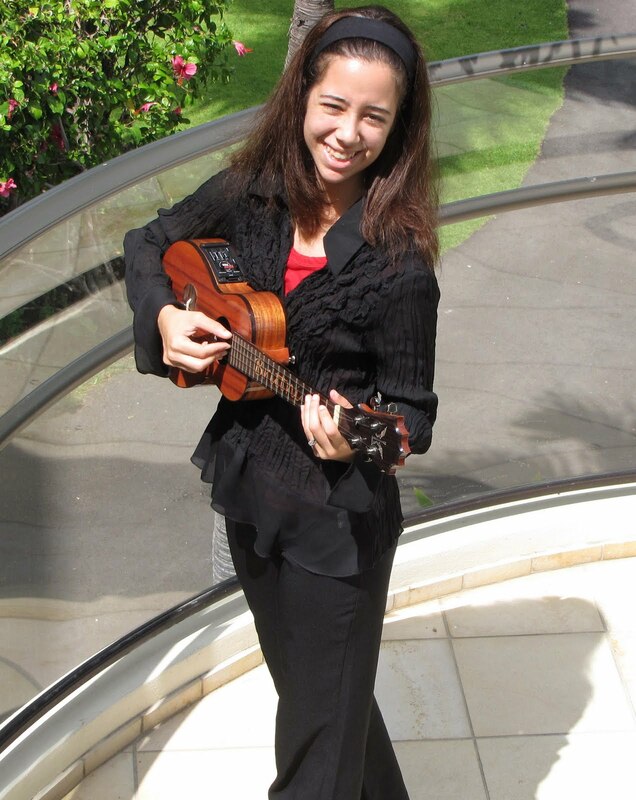 LCU: What advice to you have to the aspiring ukulele player? Brittni: Just keep on keeping on. We'll hit bumps in the road when we're learning how to play, and that's perfectly normal, but don't tell yourself "you can't do it." Once you get into that mindset, you're limiting yourself and in the end you won't ever accomplish something greater. Always be positive and tell yourself that you can do it because you can! The only limit you have is the limit of your mind. LCU: Any upcoming projects or tours that you would like to tell us about? Any chance you might get to the Midwest? Brittni: We're headed to Guam on July 20th and to the East Coast on July 31st. I'm hoping to tour the Midwest sometime in the next few months. That would be fun. LCU: Thank you so much for taking the time to answer these questions. Brittni: Thank you so much for interviewing me! I really appreciate it! Brittni’s other albums include Brittni x 3 (2004), with her playing guitar, bass and ukulele, Hear (2005), and Brittni (2006). 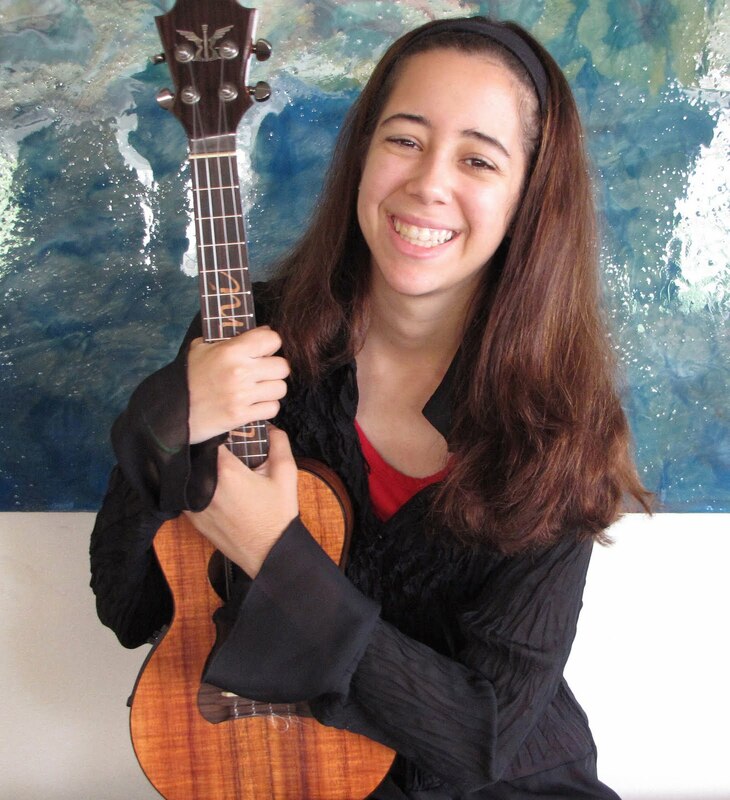 Her 2006 album was the 2007 Hawaii Music Awards Peoples' Choice Winner for Ukulele Album of the Year, and was the 2007 Na Hoku Hanohano Nominee for Best Instrumental Album of the Year and Best Album of the Year. Brittni x 3 was the 2005 Na Hoku Award winner for Most Promising Artist of the Year, as well as the 2005 Na Hoku Award nominee for Instrumental Album of the Year and the 2005 Hawaii Music Award nominee for `Ukulele Album of the Year. All of her albums, including her latest, can be purchased on her web site store. Brittni’s 4-string KoAloha tenor is made of Koa with ebony binding, fretboard, bridge and head plate (which has a black mother of pearl logo). Other inlay work includes an ebony Star of David on the back and her trademark "Brittni" fretboard inlay done in Tulip wood. Brittni’s pick up is a Fishman Prefix Pro. For more information go to Brittni's website and for more music videos, check out Brittni's YouTube channel. Brittni's beautiful soul flows through her fingertips and into her ukulele each time she plays. Her CDs are a must have in any musical library. When she worked with jazz musician Tom Scott in LA on her latest project...it was a thing of beauty. Aloha Brittni and mahalo for sharing your amazing soul.